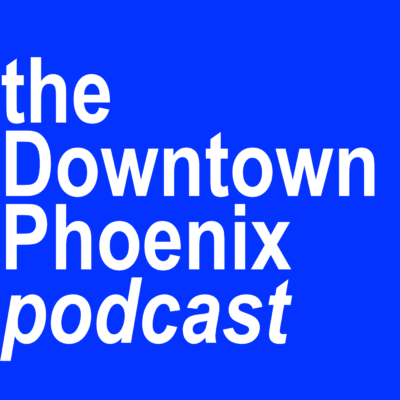 The Downtown Phoenix Podcast was a project I created in 2014 to try to bring spacious conversation to issues relevant to the urban moment in Phoenix. The first (and so far only) series consisted of eight episodes featuring interviews and perspectives that weren’t normally a part of the urban Phoenix conversation. It was a project that was guided by ten editorial principles because, even though it was a podcast, it was an attempt at serious central-city journalism. What’s the status of the Podcast? Production of new episodes is on hold for now. The project is certainly one that needs to come back and I’m willing to do it; however, production takes time and fitting it in to my schedule, my day job, and paid projects, makes it challenging for the time to be found. If a central-city Phoenix organization is willing to take it on, let’s chat. Who was/is involved with the Podcast? The original 2014 series was produced by me (well, my eponymous consulting firm) and the original production space was a conference room in the offices of the then-Downtown Phoenix Partnership (you might know them today as Downtown Phoenix, Inc.). Although they were gracious with their space and lending their audio equipment to the cause, they didn’t have any editorial involvement with the Podcast. What’s with the title and filler music? You’re hearing extracts from The Carnival of the Animals by Camille Saint-Saëns. I found a public domain recording of this work so I didn’t have to pay music licensing fees. See if you can identify the individual movements I used. Can I still listen to the original eight episodes? Yes, you can! I’m not going to take those offline because the content in most of the episodes is still timely today. Also, they are a part of my career portfolio and I’m also very proud of this work. You can click on the banner image for each episode to go to a page with the archived show notes and links from the original 2014 release as well as listen again to each episode. Episode 1: “A Podcast of Action” (released 3 March 2014). The inaugural episode outlined the mission of the Podcast and had then-Downtown Phoenix Inc. CEO David Krietor in conversation. Episode 2: “The Importance of Involvement” (released 10 March 2014). My guest was G.G. George, longtime Phoenix community advocate for neighborhood preservation issues. Episode 3: “(en)Hance-ing a Park” (release date: 17 March 2014). Coincident with the unveiling of the first pass of a master plan for central-city Phoenix’s Hance Park, I was joined by three key players at the time to make Hance Park’s renaissance a reality. First, Ann Wheat of the City of Phoenix Parks & Recreation Department talked about the City’s parks program and its role in supporting urban parks. Next, Phil Weddle and Kris Floor discussed the then-new Hance Park Master Plan and the community forums held to make Hance Park a community asset. (Note: This master plan was superseded by a different firm’s master plan.) Finally, Lillian Habeich of the Hance Park Conservancy stopped by to discuss the Conservancy’s role in raising funds to make the public-private partnership to build Hance Park work. Episode 4: “Looking Back / Looking Ahead” (release date: 24 March 2014). My guest for the hour was Jon Talton, a veteran Phoenix observer, newspaper columnist, and keeper of The Rogue Columnist blog. He offered his take on Phoenix and some of the things it has to tackle to be viable in the years ahead. Episode 5: “The Phoenix Budget 101” (release date: 31 March 2014). This was the first of two episodes dedicated to the City of Phoenix budget and its budgeting process, which was happening at the same time as this episode was released. Despite me not wanting to talk for the entire episode, I did just that, offering observations on how the City’s budget process works and how it compares to other forms of municipal budgeting. As I joked in this episode, I was finally putting my University studies to good use! Episode 6: “The Phoenix Budget 102” (release date: 7 April 2014). Now that budget theory is out of the way, I sat down with Paul Loomans of the Phoenix Spokes People to talk about how citizen input at budget hearings impacts what goes in to those budgets. Episode 7: “From Point A to Point B (and everywhere in between)” (release date: 14 April 2014). No urban-focused journalism can do so without focusing on transportation issues and the penultimate episode of this series focused on that. I was joined by three guests to talk about transportation issues. First, Mark Melnychenko of the City of Phoenix Streets Transportation Department sat down to discuss the Downtown Phoenix Transportation Plan. Jennifer Longdon joined me to talk about accessibility issues in transportation. Finally, Feliciano Vera came by to talk about the City’s efforts for creating bicycle infrastructure. Episode 8: “Assessing the Health of Our Communities” (release date: 22 April 2014). This was a challenging episode to produce because this came on the heels of the news of a friend to many in downtown circles taking their own life. Malissa Geer and Judy Butzine stopped by to offer thoughts on how advocates can make sure they’re taking care of themselves as they embark on their work.